After what felt like a long break from racing punctuated by endless hours of training, it was time to toe the start line again. This was my second warm up / practice triathlon before Edinburgh 70.3, chosen primarily for its open water swim and proximity to Edinburgh. Unfortunately, registration was the day before and the start was horrifically early, so it was still a weekend trip! Glen and I headed over to Loch Lomond and sussed out the swim area, the start of the run and the start and finish of the bike. 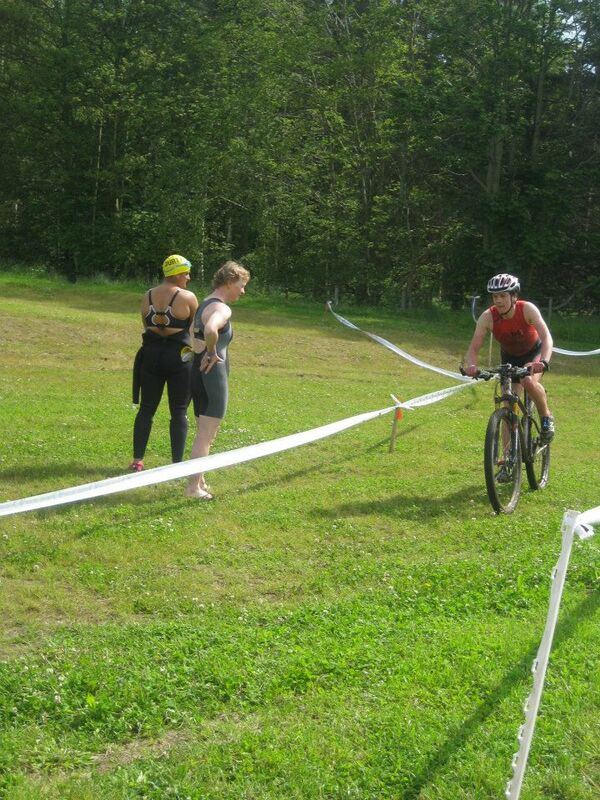 The transition from swim to bike looked much longer than stated in the manual. I checked it with my watch. 750m, not 300m! I hastily formed alternative transition plans in my head. It wasn’t so bad to be out west overnight, as we stayed with my pal Douglas and dined at a fine Italian place (burrata with roasted peaches and caramelised almonds with sage, don’t mind if I do). After really not enough sleep (about 5h) I roused myself, got kitted up and off we stumbled, slightly later than planned. Race information about timings between emails and website was inconsistent. We needn’t have worried though, since we had plenty of time to park, get set up, queue for the toilet and get to briefing on time. Well, Izzy and I did. Glen followed later but still was on time, as it happened. There had been some delay for the middle distance racers in front of us. They started late, but even then, after a while I was beginning to wonder why no-one had got out. Turns out one of the buoys was slowly drifting, drifting … They moved it as half the people on the last lap were still aiming towards it .. Hilarious to watch from the shore, though perhaps confusing when racing. I heard people say they had done 1000m extra! Next it was our turn and I was rather hoping for 1000m extra, it might play to my favour. The water was warm-ish and the threatened compulsion to wear gloves, booties and neoprene hat did not materialise. This suited me as I prefer to swim without when I can. It also meant I could change quickly into shoes that I had waiting ready to pull on over my Gococo socks as I left the water. As we started, my breathing felt laboured and I had to work hard to get in a rhythm. The swim played out as it often does. A front group got away, there was a gap, then there was me passing people on lap 2 until the gaps got too big. Apparently I was 13th out the water, but I was disappointed with my time. I’ve been working a lot on my stroke and being more consistent in training but it doesn’t seem to be paying off yet. On the other hand, I had a storming transition. 5th overall. Message me if you want tips for next year!! As the bike went on, I remembered to admire the scenery and to practice eating and drinking. But then it started raining. I had not realised that my handlebars became like slippery snakes when wet and not wearing gloves. I could either be safely on the tribars but with no ability to brake, or clinging to the outside bars (bull horns) with a death grip, as my hands slithered and slid. Lesson learnt. Two girls flew past but I tried to stay calm even as I trundled along behind a tractor. We re-joined the main road and the traffic had got heavier since the morning. After a couple of close passes I made myself ride further out in the lane, trying to hold my nerve. Overall this was a frustrating ride as my time was well down on my target. This despite a lot of extra biking since the race in Tranent taught me I needed to do some work in this area. I’m still unclear whether this is just technical (in)competence on the TT bike or also fitness coming into play. I lost a 6 minute lead to one of the girls behind me! Anyway, it was time to run. 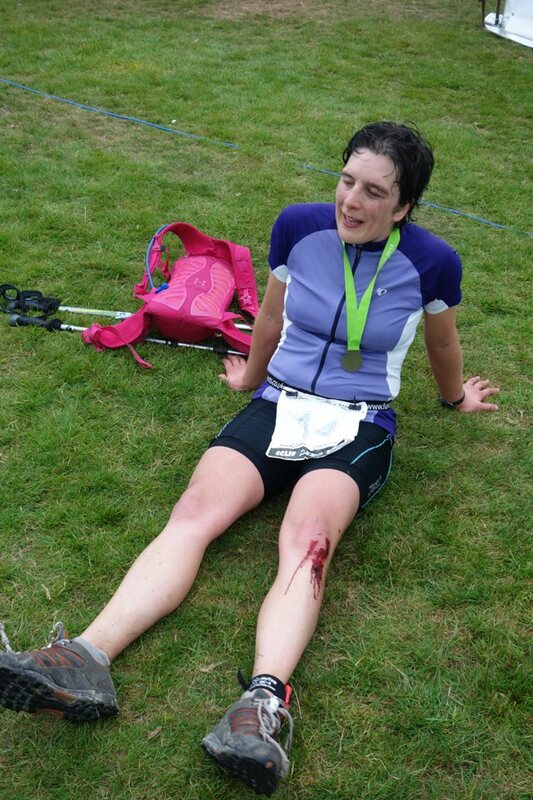 I left transition just after one of the girls who overtook me. She was in sight for a few km, but was gradually pulling away. Another obviously did not intend to finish and had turned earlier. It was an out and back course, so it was easy to check positions. Emma Lamont, leading lady, was about 3km ahead of me! Then the next two girls fairly close to each other, but with a good gap to me. Round I turned, who was behind me? No-one for a long way, so it was a matter of pride and personal satisfaction to keep pushing on. Final position .. 4th female, 23rd overall. Results here. If there had been veteran prizes I’d have been first in that class, but there weren’t!! It was a good race, decent course and well organised. 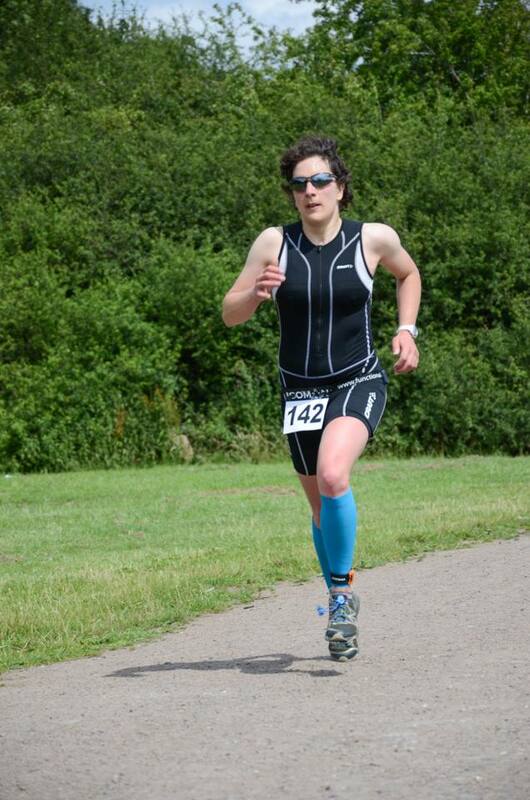 I wish my swim and bike had been better, but I still learnt useful things for July. My body was also telling me I had had a good workout as my legs seemed reluctant to hold me up for the rest of the day, even after administering macaroni cheese and chips!! There’s not much time until Edinburgh 70.3, but somehow we’re squeezing not one, but two, swimrun races on back-to-back weekends before then! Bring on the sunshine, swimming and running. Isoman is described as ‘triathlon evolved’. The principle is that each discipline takes about the same amount of elapsed time and therefore, theoretically, each has equal importance. Back in my university days (when I only swam and ran) I might have agreed, but now I’m not so sure! In any case, Izzy and I entered this race because it fitted well with our Ötillö swimrun training plans. I also like doing new things. There was a full distance event at 11km swimming, 90km biking and 42km running. Despite flirting with that idea, we had both sensibly gone for the half distance instead. Anyone who knows anything about triathletes will know that many of them dislike the swim and see it as something to get out of the way. In contrast, this event was a swimmer’s race. 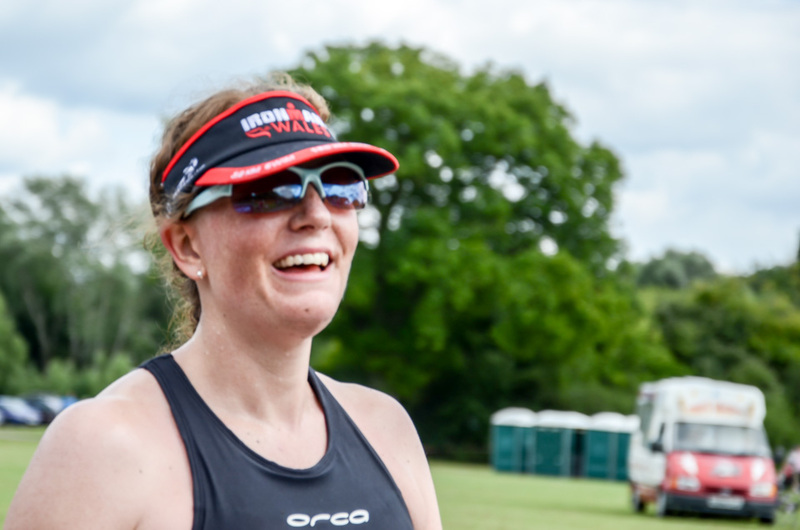 Despite a very accessible 45km bike leg, and a tough but achievable half marathon run, entrants to the half still had to be up for a 5.6km swim! Preparation for the race had been far from ideal. Although I had done most of my training, work had been more manic than it has been for years. Lots of late nights, shortened sleeps and extra stress. I also did not target this race and my taper, such as it was, was merely an easy week beforehand. I arrived at the race fit, but not exactly zingy! 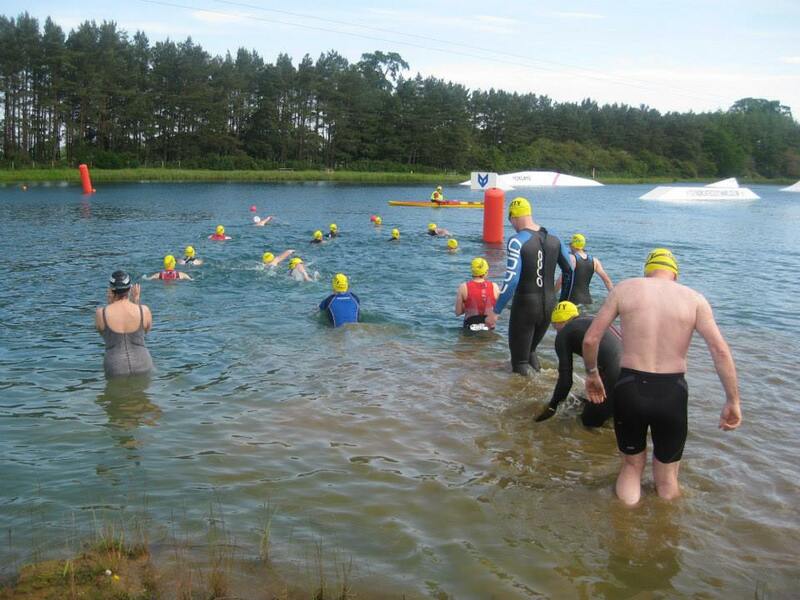 And so we found on a sunny morning in Redditch that we were lining up for a four lap, star-shaped swim of the lake in Arrow Valley Country Park. The water was green and murky, which makes a change from the brown and murky that I’m used to. It was also really warm. Although the swim was much longer than usual, the pattern of racing was the same. Some people shot off, I started at a sensible pace, found myself bridging groups and gradually overtaking towards the end. I got into a kind of metronomic state, with my arms swinging over as I counted strokes and sighted every 12th. It was calm and the banks were close, so it was quite easy to swim in straight lines. I saw Izzy as we went under the timing mat for the last lap. My time was much slower than for the similar length swim race in Manchester, but I had been acutely aware of making sure I could still stand and safely ride a bike afterwards. 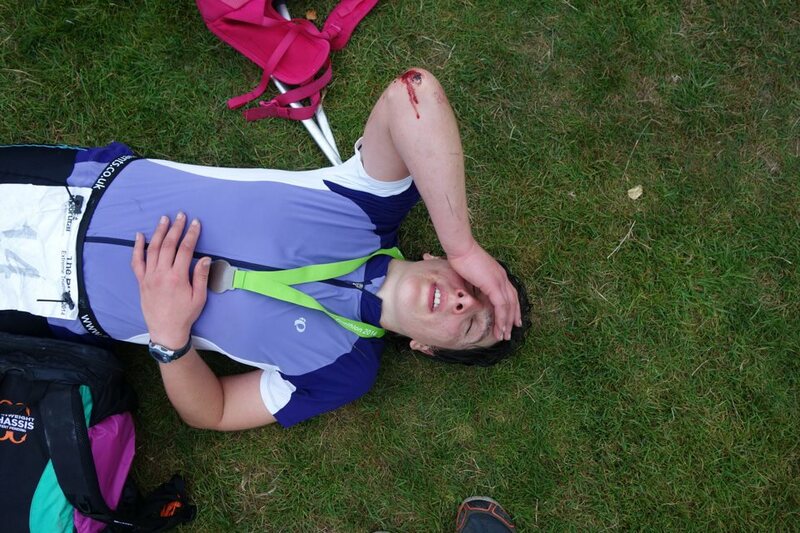 My last road triathlon had involved a heavy crash off the bike out of transition and I didn’t fancy a repeat! Still, I was more than happy with the consistency of my lap times (24:16, 24:46, 24:46, 25:12). One unique aspect of this event is that the transitions are timed out for up to 7 minutes (T1) and 5 minutes (T2). So I took my time to go through smoothly and even say hello to Izzy as she came in just after me! Out onto the bike leg. I was riding my new time trial bike for the first time in a race. In fact, it was only about the fourth time I had ridden it all, and certainly the furthest I had ever been on it! The first part of the ride was on a dual carriageway. The traffic was very light, but I was too afraid of excessive wobbles to check over my shoulders for cars and was mostly concerned with staying upright! Once we got onto the county lanes I settled down a lot and my next concern was how to drink. I had forgotten to practice this bit … It was wobbly, but I managed it by dint of slowing down. After a while I even found that I was enjoying myself. My average speed was just under 30km/h. I’d be happy with that over double the distance on my road bike, but I’m sure there’s room for improvement there! A perfectly timed 5 minute transition and I was out on the run. I had really been looking forward to this part. It was to be a test of how much I’ve improved recently. However, after about 5 minutes my shins started screaming at me. They were really painful. I decided the best cure would be to tell them to shut up and keep on running 🙂 It felt like I had to slow to a jog though. Sure enough, after about half an hour whatever the problem was resolved itself and I felt fantastic. About 10 minutes later I started to melt … The sun was beating down, far more than I am used to ‘up North’. It must have been at least hitting the heady heights of 25 degrees. 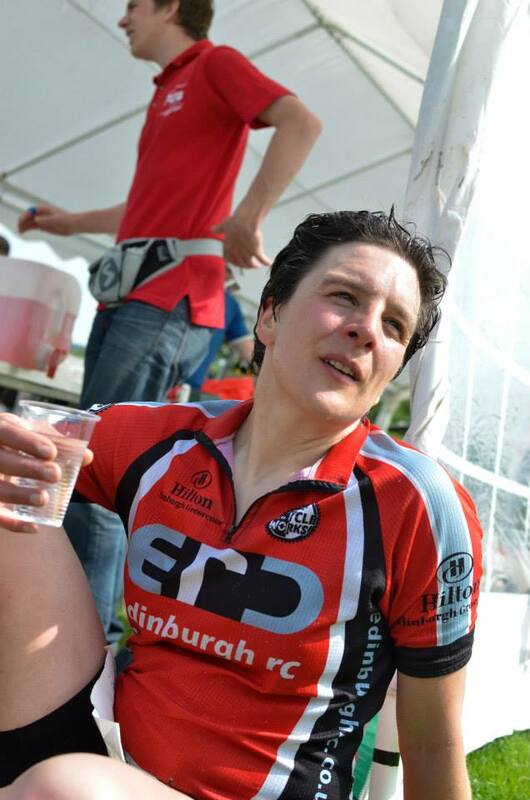 I took a cup of fluid at every aid station but the tell-tale signs of heat exhaustion / dehydration were kicking in. Shivers, wooziness, swollen hands. I gritted my teeth and kept plugging away, knowing the end was near. As soon as I fell over the line I crawled into the shade of a bouncy castle to drink and cool down. The facts do not lie, my two times were only 18secs apart. Which is strange as they didn’t feel the same! I was disappointed with my run time (which was 10-15 minutes slower than I had hoped for), but knew I couldn’t have done any more on the day. The race was much harder than I expected. Which is back to this business of being equalised … Compared to a middle distance triathlon, we had basically swapped an hour and a bit of biking for the same of swimming. And I’m fairly sure that biking hard is less tiring than swimming hard. A bit of results analysis also shows that for over two thirds of the field, final positions didn’t vary by more than 5 places from when they exited the water. Eventually after various revisions of results, I was confirmed as 3rd female / 10th overall. It was a shame podium positions were only given to winners, but it doesn’t change the result. An interesting touch is an award for ‘most equal’ athlete based on time. I placed 6th in this competition and wonder what could have been if I hadn’t been so knocked out on the run! Izzy was 4th / 16th, so it was a good day out. Overall I had enjoyed the race, despite my body reeling for a couple of days afterwards from the effects of the heat! It was well organised and the marshals were friendly. There was every opportunity for people to take part, with a quarter distance race and options to enter single discipline races as well, which Andy happily availed himself of (beating my half marathon time by 5 minutes!). Andy found it hot as well! It’s been oh so quiet … Since Itera I have not been doing much. I learnt my lessons after the last expedition race I did (the Terrex in 2010) and this time I wasn’t getting back into anything too quickly. So I spent 3 whole weeks eating, sleeping, pottering to work on my bike and not much else. When I did my event planning for the year, I thought perhaps I could combine Itera training with iron-distance triathlon training. 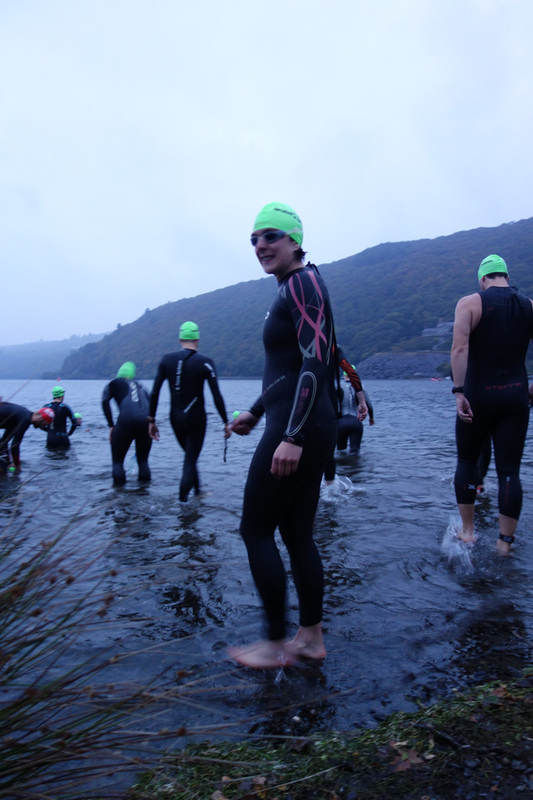 So I kept my eye on an event near my dad’s house in Llanberis 5 weeks after Itera, which I could enter at the last minute providing I had recovered well and was feeling fit. As it turns out, I did recover well, and managed a good strong week of training after my 3 weeks of recovery. But the event I had in mind (the Brutal) wasn’t just normal iron-distance; the run had large chunks off road and finished with a run up and down Snowdon with a buddy. To be honest, I didn’t have the motivation to race that hard for that long and face another few weeks of tiredness. I hadn’t done any specific training and was feeling pretty satisfied with the year from a ‘big race’ perspective. I was also starting to feel good again and had my eye on quite a few events for the rest of the year! Is it me, or is it still quite dark?! So instead I entered the ‘half’. Half the distance, half the laps (I’m not a big fan of laps), half the price and I could run Snowdon at the end by myself. I innocently thought I could just bash this one out, feel good for the rest of the weekend and carry on uninterrupted 🙂 . On Friday we ended up walking down through the woods to town twice, once to register and once for the briefing and to set up kit in the transition marquee. I managed to get a lift back up the hill twice though, despite my dad’s poorly leg! The first ‘brutal’ part of the event was the start time. I set off from my dad’s house to pedal down the hill at 05:25. Urgghh! It was still dark and the road was twisty and gravelly. I stayed safe though and had plenty of time to find a space to rack my bike (it was pick your own spot, I went for last rack, second frog from the end) and double check all was still as I left it in the tent. We each had our own chair – very unusual! But this event not only had people out doing the full distance, but also some doing double that again, and not finishing until late on Sunday. OK, I admit, as well as debating between full and half I did also consider the double … but sense got the better of me. The lake wasn’t cold for the swim, about 16ºC. 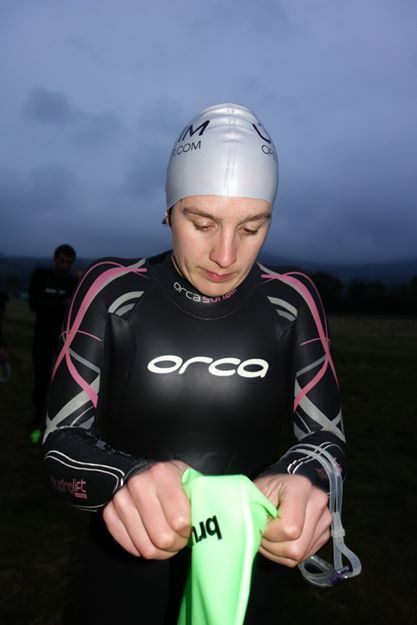 My main problem was not having worn a wetsuit since my last triathlon on 29th June and having done just three swim sessions since the end of July, 8 weeks before. My arms felt constricted and a bit heavy, but I got on with it. 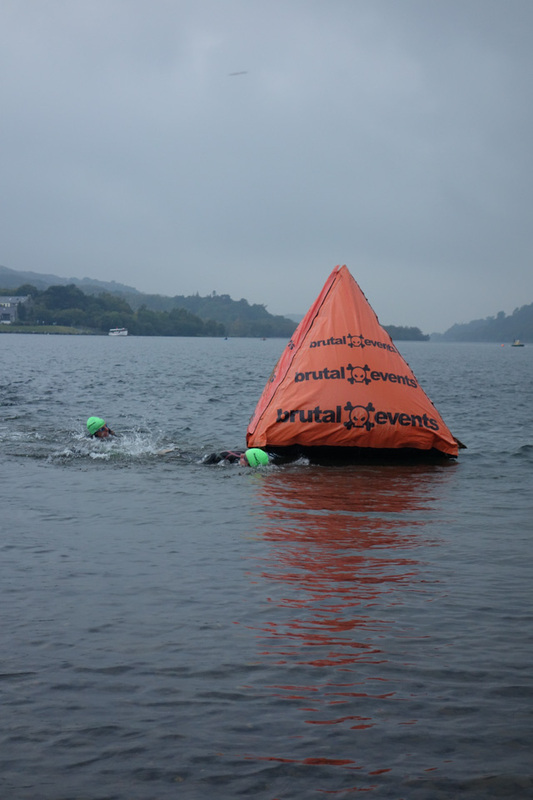 We were confused at the first turn by all the orange buoys – which one was ours?! I swam a bendy line but got back on track. Two laps later and just 2 minutes slower than I had planned I was running across the field into transition. Getting in. Last time I did this here it was midday, sunny and I was not in a wetsuit! A quick changeover and I set off on the bike, with Andy cheering. About 200m later I was still feeling a bit weebly wobbly from the swim, was worrying about whether I should have tucked my jersey under my race belt and noticing I could see the lake on my right and thinking I might be able to glimpse long course swimmers. Next thing, I looked up to see I was heading towards the kerb at high speed. There was a wobble, I don’t know exactly what happened, but I knew I was going down. Smash! I catapulted head first onto the pavement. My immediate thought was ‘I’ve hit my head, I’ll have to stop’, immediately followed by things such as: Is my new jersey ripped? Are my shorts OK? I’ve dropped a bar. There’s blood. No broken bones. Lucky I wore gloves else my hand would be full of holes. I’m not unconscious. Is the bike working? Pretty quickly I was astride my bike, tucking my jersey in (didn’t need that thought distracting me again) and cautiously pedalling along the course, away from transition. My tri bars were a bit askance, but usable. My arm hurt to rest on them, but was bearable. My elbow and knee were bleeding, but moving. There were no holes in my clothes. The brakes and gears were working. I carried on. The next 25 minutes were slightly hesitant. I ate and drank and monitored myself, especially when I saw a few stars. But then I decided, if I’m still doing this, I need to get on with it. I started to watch my speed and keep the power up. Each lap had a flat bit, a short sharp up and down then a long ride along the beautiful valley from Waunfawr to Beddgelert. Then there followed a long steady climb. As my dad has told me, it was graded for a horse and carriage, so you can ride a lot of it on your tri bars in something other than your lowest gear. Over the top and it’s a fast, twisty descent back to the start. I had to do 2 laps. At the start of the first long climb I had just caught another girl. I ate a bit and planned to ride past on the climb. But she pulled away!! I lost her somewhere over the descent, but she must have paused as she went round for lap 2, perhaps to pick up a bottle, because she popped out just in front of me again. I came past and opened a gap but then there were traffic lights on red. She caught up and went by on the hill. I decided to just work at my own pace along the valley and keep her in sight. Although the gap between us varied a bit, it was never more than about 100m. I assumed she would go again on the climb, but I think she had worked harder knowing I was there this time and was perhaps a bit more tired. In fact, the results say we both went faster the second time around! I was holding the distance between us, and then somehow managed to catch her. We exchanged a few amicable words, then I passed and came into transition with a slender 1:20 lead. The first part of the run was round the lake. It was flat on the first side, then up a steep road and into the woods, with variable gradients and surfaces. Andy jogged next to me for a couple of minutes, which was nice. 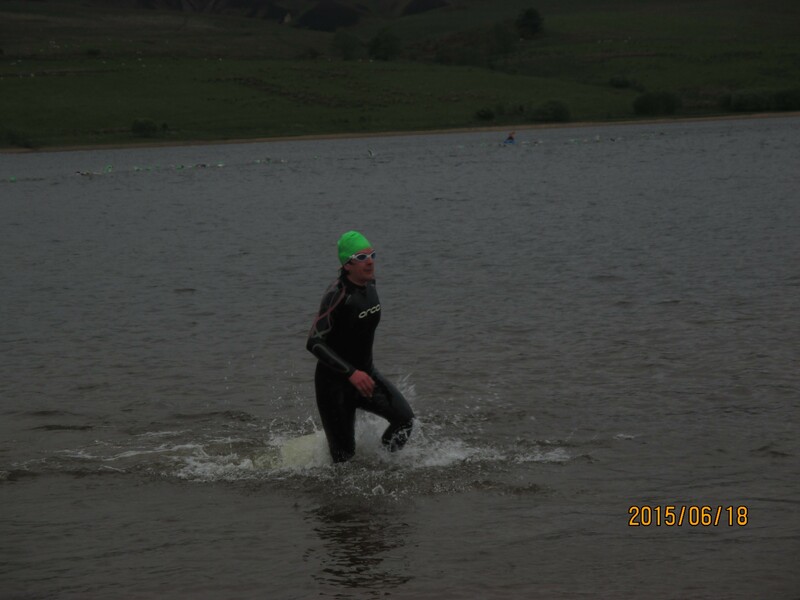 I was in a lot of pain as I’d had stomach cramps since the end of the swim. Sometimes this happens and I don’t know why. It wasn’t because I’d eaten gels and bars either! I’d had two bananas, a big square of sticky rice cake, a porridge bite, a mouthful of a bread thing and water and Nuun (electrolyte solution). I could hardly stand upright but eventually it eased as I ran along the lake shore. As I slowed to go through a gate I realised I was quite dizzy … I had another porridge bite and then a bit later a gel. I was gasping for water but expected the feed station as we turned off the road. The girl I had overtaken on the bike caught me up on the road hill. She was looking bouncy and I was dying! I know running is not my forte, so had expected to be caught given how well she climbed on a bike. I had no choice but to let her go. At the feed station I gulped 2 cups of water and 1 of squash and felt better. Running back to the transition field I was actually feeling OK! To go up on the mountain, we had to carry compulsory kit and pass a medical check. As I ran in, I was asked ‘do you need to see the medic?’ I assumed this meant, ‘are you ready to go up the hill?’. I looked confused and said ‘but don’t I need to get my mountain bag first?’ (as this also got a quick check). Back came the reply ‘you’re bleeding!!’. Oh yeah, I’d forgotten about that. But the blood had mostly dried up by now and I was on a mission. I got my bag and went for my official check. The medic asked me more than once … are you sure you don’t want it treated? … But I said no, it had been like that for 4.5 hours already, it could wait a couple more. I was allowed to go! On the lower slopes I was sweating profusely and very glad it was an overcast day. Andy appeared again for a bit and gave me some encouraging words. After he had gone, Kev (another racer) caught up with me and very kindly accompanied me to the top. He had done this event last year and could give me pointers on what was coming up and how fast to expect to do it. He also kept me motivated to move when I felt like stopping (as I didn’t want to slow him down) and checked I was alright in woozy moments. I felt a bit sick but also realised that tripping over my feet and the dizziness when I paused were due to lack of food, so I made myself eat some more. We overtook crowds of tourists, including someone in a onesie. Really? There were cigarette butts on the floor, and Kev remarked he wasn’t sure if he was impressed or horrified. People kept asking me if I was alright and I kept thinking I must look dreadful, until I remembered the blood all over my leg. We didn’t run for long as it got pretty steep and my legs were tired. 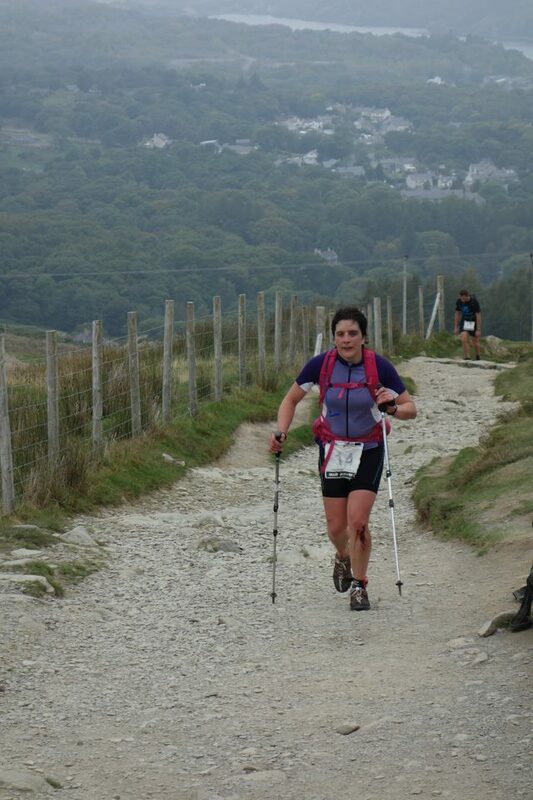 My calves were also threatening to cramp and I was extremely grateful that I had taken my poles with me! Given how I felt when I stopped using them to eat I definitely know they were helping. Because you come back the same way you go up, you can see where everyone else is. After we saw the leading lady going down, it took us 6 minutes to get to the top. It was quite cold and wet, as the cloud and fog were heavy. I told Kev to go down at his own pace. I know my descending isn’t great. I wasn’t giving up though, as visions of being caught in the Coniston race played on my mind and Andy had told me off earlier and said not to settle for ‘third is OK’. 3 minutes after I’d turned, I saw the next lady going up. We said hello, and I wondered how much faster going down was than up! Now I knew I had to go for it. This was one of my aims for the race. 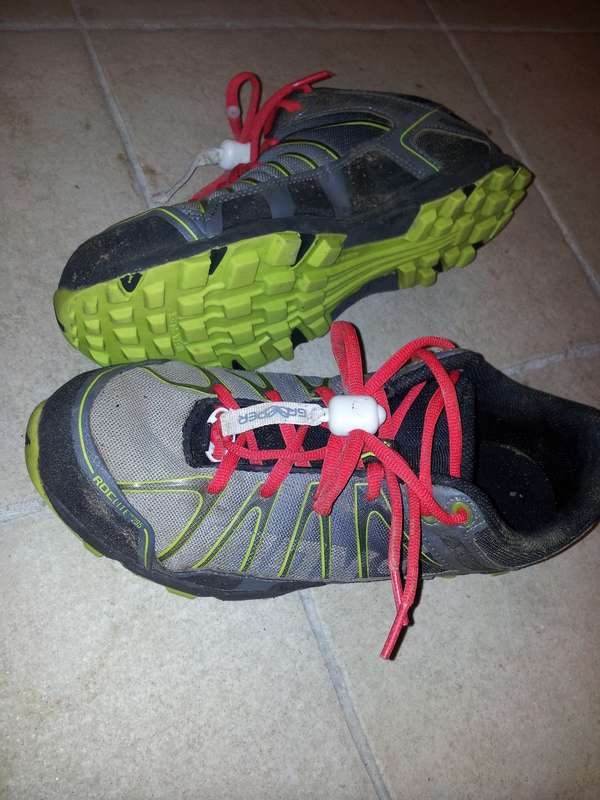 I wanted to remember how it felt running off the Brecon Beacons on a tow behind Sam at Itera. If I could do it then on day 5 with blisters, I could do it now for sure! Off I went and actually kept Kev in sight all the way. I passed the halfway house. I almost got calf cramp again, several times. I almost face-planted, but didn’t. I reached the road. Still only one person had come by. I allowed myself to check over my shoulder and could see ‘someone’ about 200m behind. I was determined not to give in, and my poles click-clacked on the steep road. We reached the first row of houses and it was maybe only 300m to go. I nearly got cramp again! So I had to moderate my speed and try and work out how to land and pick up my foot not to set it off. Then there was the finish archway, and I was under and I was second. Yay! Compared to my target times I had done alright. A couple of minutes down on the swim (due to lack of specific training), and a few more on the bike (due to crash, cramps, lack of ‘fast’ riding recently and fighting a bug the previous week, I think). My lake run lap was spot on target. 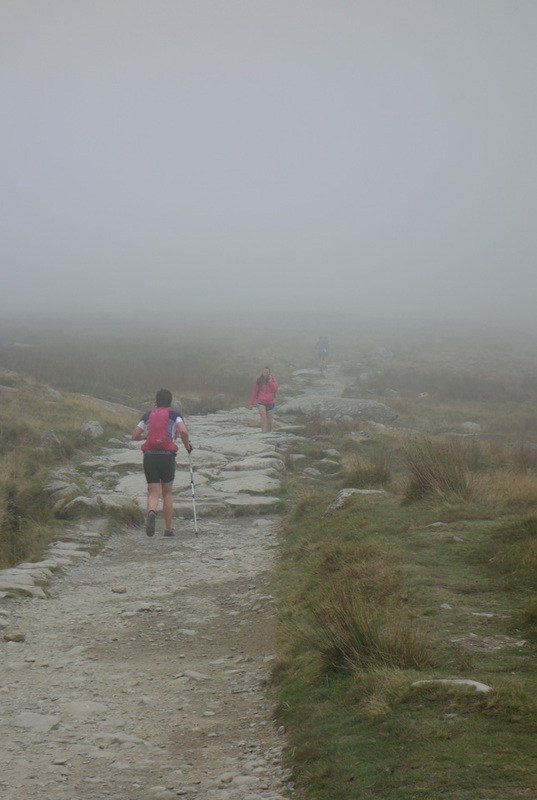 My mountain run was much slower – but I had underestimated the difficulty! It didn’t stop me being proud of my descent and of holding my time compared to 3rd. Interestingly, my overall placing for the mountain was lower than for the rest of the race, but 10 minutes would have lifted my place for ‘Snowdon only’ by 16 spots. People’s times on this section were close together. My race against 1st was lost on the run, but my race against 3rd was won on the swim. Many thanks to Brutal Events for putting on an event with such a great atmosphere. 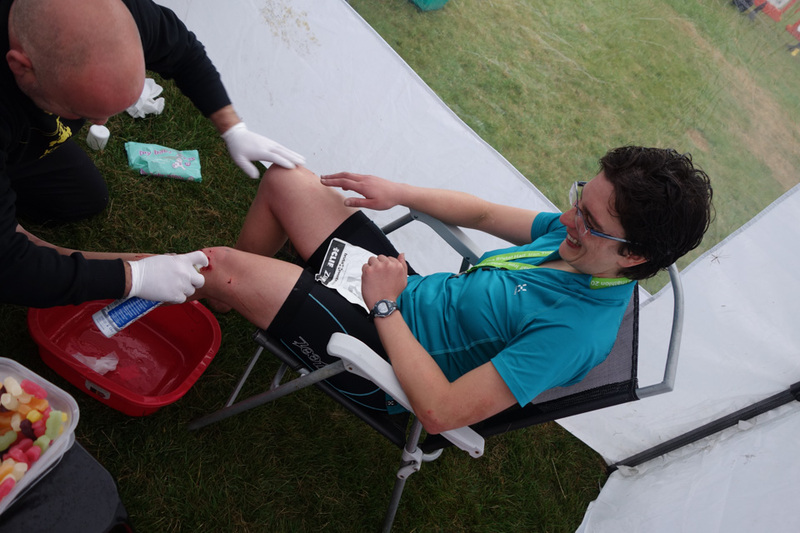 Also to Andy Kirkland for the photographs (click on the link for a gory knee close up shot)! Have I ever mentioned how much I like cycling? 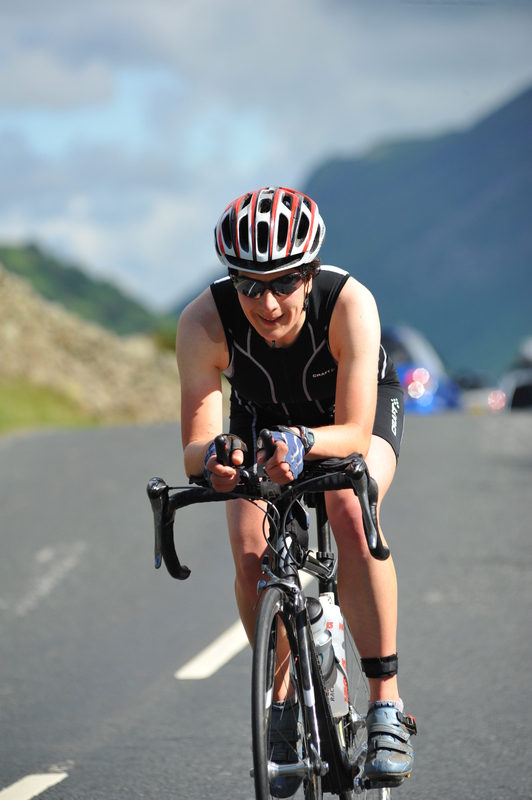 A month ago I raced the Coniston Old Man triathlon and did not have a good time. When an adventure race I was supposed to be doing a month later was cancelled, I looked again at a Day in the Lakes. 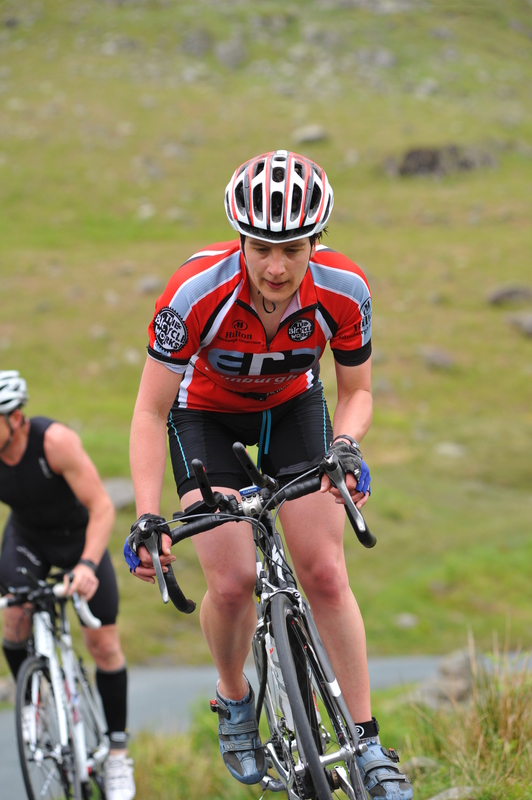 On the surface, it is a similar race; middle distance, hilly bike, fell run and in the Lake District. However, this one seemed to be more suited to my strengths. Hills, yes, but not so steep I might fall off or over going up or down them! It was also easier to get to. After a mere 10km pedal from Penrith train station, I was at the campsite sorting my kit and waiting for Andy with the tent. Although we had a relaxed evening in the company of Andy’s pal Ollie, by race morning my usual nerves had kicked in. The swim buoys were 500m apart and difficult to see, even though they were huge and yellow! I think this is becoming a common theme for me. I just followed everyone else. I tried to start aggressively, and it was working. That is, until my eye was bashed, my goggle filled with water and I had to sort of edge my way to the side of the pack to empty it. Other than that, the swim was more or less uneventful. I think a few people cut a corner at the top; they probably just missed seeing the marker as there were two close together there. I also tried to land on the wrong bit of beach, but then was out and running to transition. I hadn’t felt bad, but was further down the pack than I expected. Out on the bike I was feeling strong. Yippee! What a change from four weeks ago. I climbed the first hill without any problems, alternating between standing and sitting to vary my position – at least I had a choice this time. There had been a crash on the descent, which looked nasty but we were told later that the rider was OK. It made me a little more cautious, and soon a girl I had caught on the climb flew past. When I got back up to her again we exchanged a few words and swapped places once or twice more. On the way up the second big hill, I met Mr Pink Socks from C.O.L.T. (these guys seem to get everywhere). In general, this race had been pretty good with regards to drafting. But at this point we could see two guys working together up front! We both agreed that if we caught them we’d have words, but it was impossible to get close. I didn’t think I knew this course at all, but when I studied the map the night before I realised it wasn’t completely unfamiliar. 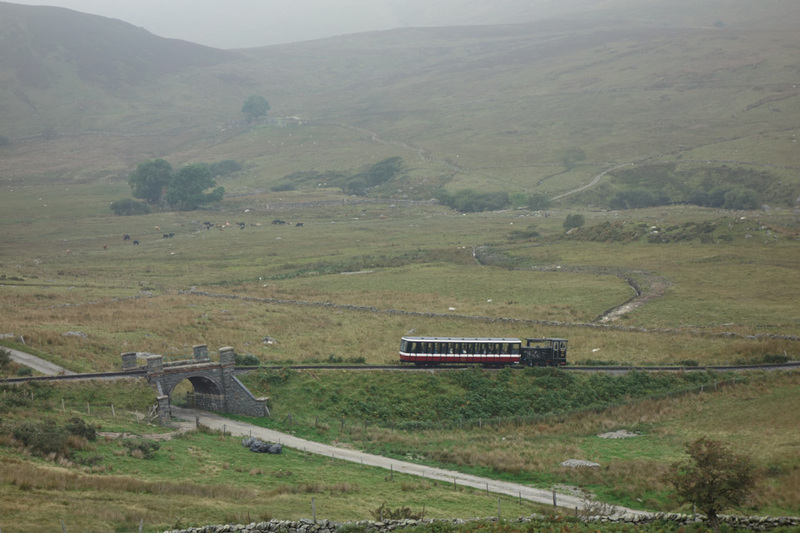 I had been over Kirkstone Pass in a car a few years ago, although all I can remember is having to make the driver stop so I could ‘get some fresh air’. Andy and I had ridden a few km of the middle section on a weekend visit earlier this year. 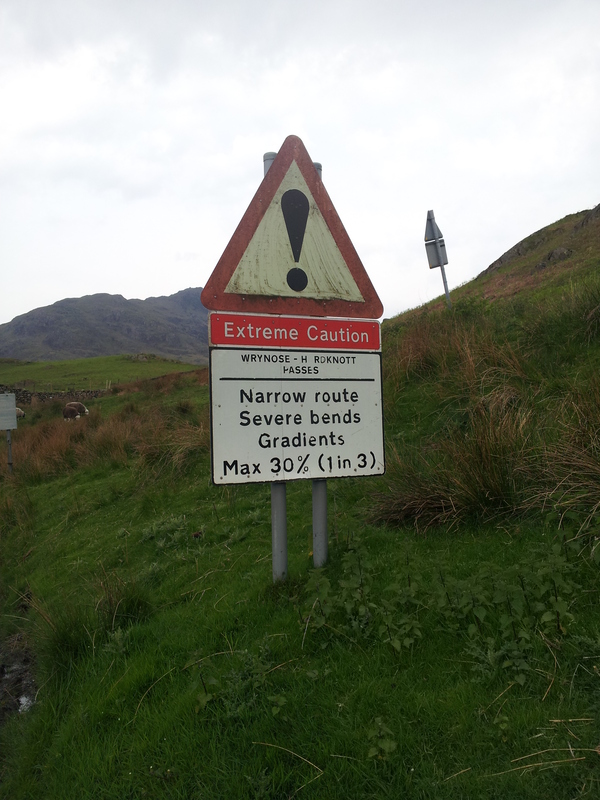 And on my way to the Coniston race, we drove over the A6 and I had remarked what a fantastic road it would be to cycle. It was here I now found myself, on my own and riding into a headwind on a long, long descent. Soon after, I was caught by a couple of people. I was in the awkward situation of yo-yoing with one of them, but I always dropped back when I was overtaken. In an attempt to get past and away I put in a hard effort, but I could see someone out of the corner of my eye sitting on my wheel. I wanted to say ‘are you going to pass, or drop back?’, but for some reason I didn’t. In these events, drafting is not only against the rules but also gives considerable gain. For all my ranting, I find it hard to address the issue mid-race. I had caught and passed Pink Socks again so he was behind me at this point. He told me later that my passenger had sometimes been freewheeling in my slipstream! In the end, I slowed and let them go. I wanted to ride my own race but not kill my legs before the run trying to prove a point. I chatted to a very successful athlete once who had this attitude: ‘They can draft, but I don’t do it. I ride hard at the front and still beat them’. This is the kind of unruffled approach that I aspire to. Then I just need the strength and speed to execute it 😀 . Anyway, back to the race. 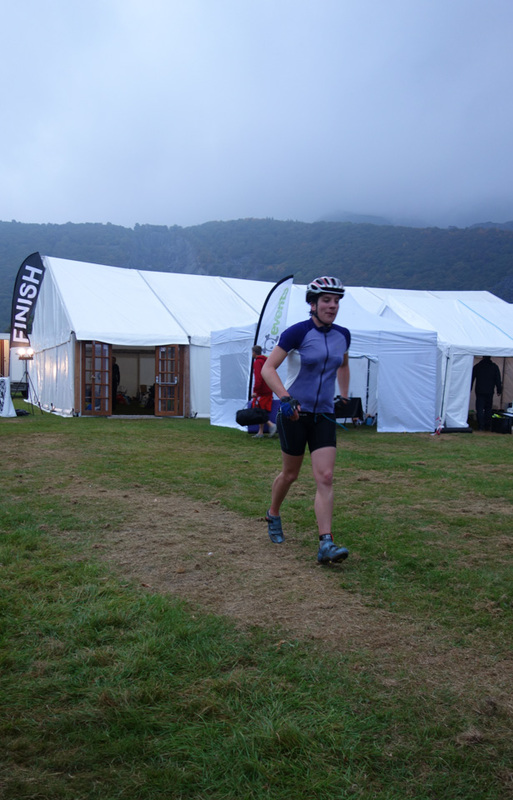 I was very pleased with how my legs had felt on the bike and it was fantastic riding through the campsite into transition. There were loads of people cheering, including an expected shout from my friend Lucy! As I started the run, I saw about 5 girls also just finishing the bike. I haven’t really worked on my ‘brick sessions’ (practicing that awkward bike / run transition that legs dislike so much) and we were soon heading upwards. I stuck at it, glad that I was also carrying some water in my new running belt. It took 45 minutes for a girl to catch me, and she was moving well. After the drinks station the second hill began and it was a tough one! Beautiful, but steep and hot. Everyone was reduced to walking. I kept drinking and took the opportunity to eat a couple of snacks, and get some cold stream water over my head. On the descent, Pink Socks came past again! We exchanged names this time, so I knew I was racing with Andy. Back past the drinks station and we faced 5.5km on an undulating road. To me, this was torture. I had an idea how long it would take, but couldn’t find the oomph to close the gap to Andy, even after a sneaky emergency gel. We passed a few campsites that weren’t ‘ours’ and as another one came into view I didn’t want to get my hopes up too high. But this time we were nearly there and I stuck at it. 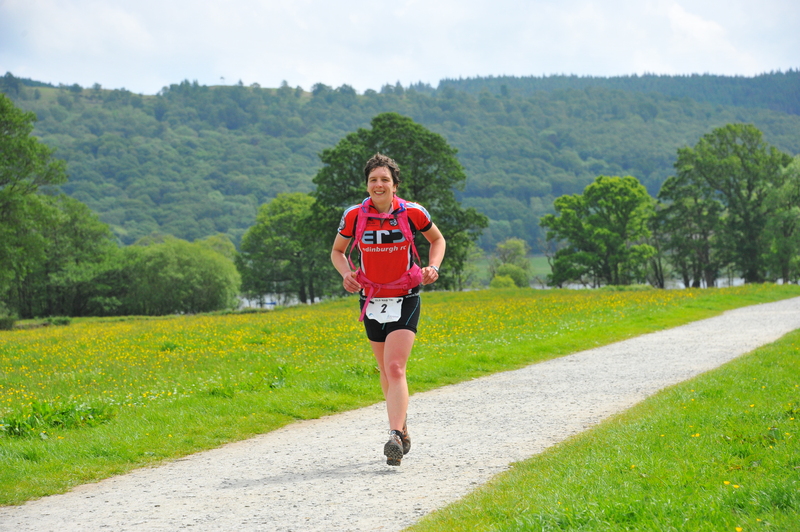 It was more like maintaining my pace than a sprint finish, but compared to Coniston, it was a very definite RUN! I was tired at the finish, but very happy. I had achieved my goal, which was to race well and feel fit. Although I only came 6th, I was still satisfied. There was strong competition, including athletes with international experience and medals. I had an average swim but a good bike. As usual, my run was relatively slow and I lost time, but I only conceded one place. I really enjoyed this race and it was very well organised. I think it could be one I’ll revisit in the future! All that remained was to pack up and get back to Penrith. This was quite a trial, as much for (my) Andy as for me. He had decided to do the run course just for fun and was feeling weary! Within 5 minutes of getting on the train I was fast asleep 🙂 . ❗ Warning: too much fun alert! After the disappointment of the weekend before in Coniston, I had had a slightly gloomy week. By Friday night my legs were still hurting and I feared for my left quad which was verging on painful. 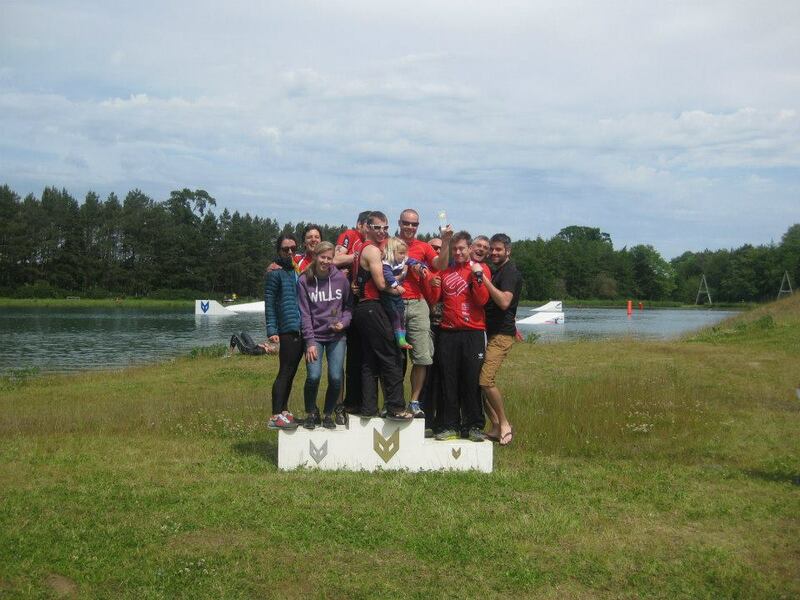 However, I had signed up for the Foxlake Tri event – relay and solo. 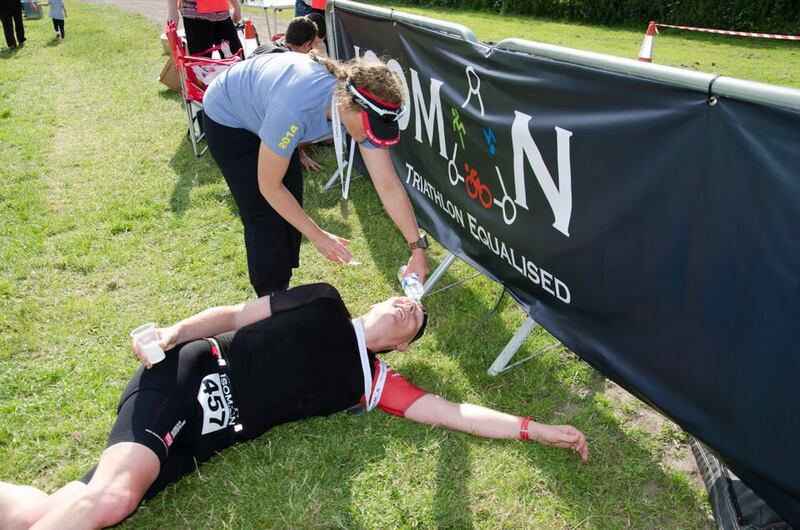 There was not a lot to suggest this race would suit my strengths – as each full triathlon lasted less than 20 minutes and I’m an endurance athlete! However, there were some twists. 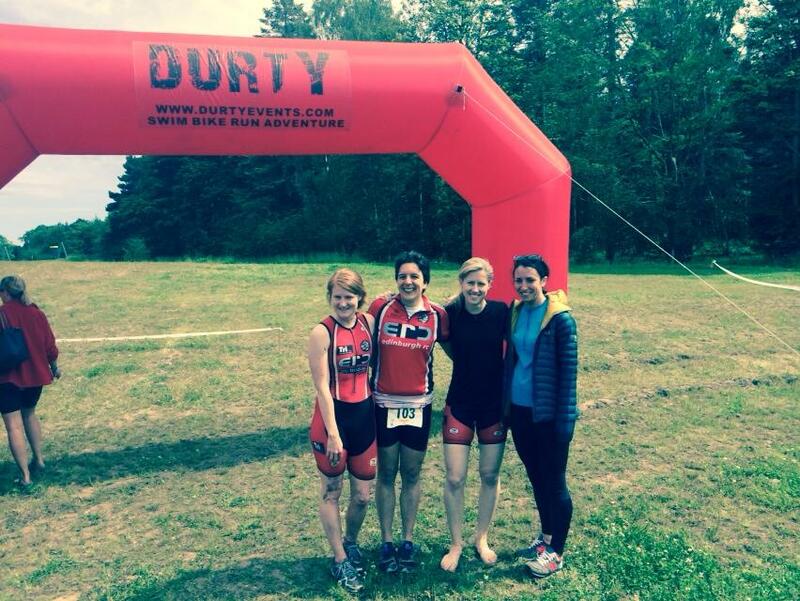 And it was organised by Durty Events, which meant there would probably be some mud involved. The first event was a relay in the same format as the Commonwealth Games. Four athletes per team, and you all do the whole race once. The second event was a solo race with multiple rounds. To prepare, there were a few things I had to do. Firstly, my rear mountain bike tyre was not holding air. A facebook plea produced an explanation, a remedy and an offer of a tutorial on how to fix it (sealant supplied). Huge thanks to Ewan for this, it was easy peasy and I am no longer scared of this job! Secondly, this race was so short that time in transition needed to be minimised. This meant wearing the same shoes for the bike and run. But I had no decent mountain bike flat pedals! Glen helped me out here, loaning me a set of pedals from his own bike. I collected them from his girlfriend on Friday night and decided the pot of grease also laid out was a hint that I’d better not let them get jammed on! (as if 😉 ). Other modifications to my usual routine included no socks and no gloves. 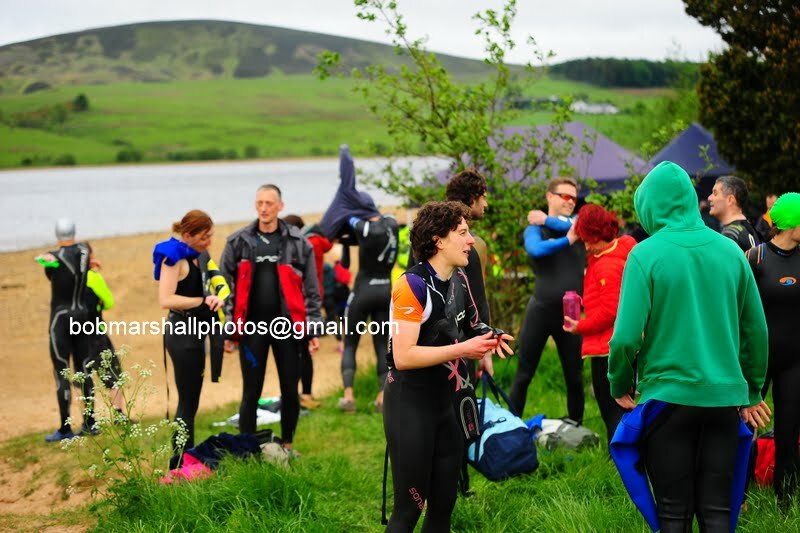 Fortunately the recent weather and the small size of lake meant the water was lovely and warm, and wetsuits were optional (I opted out)! 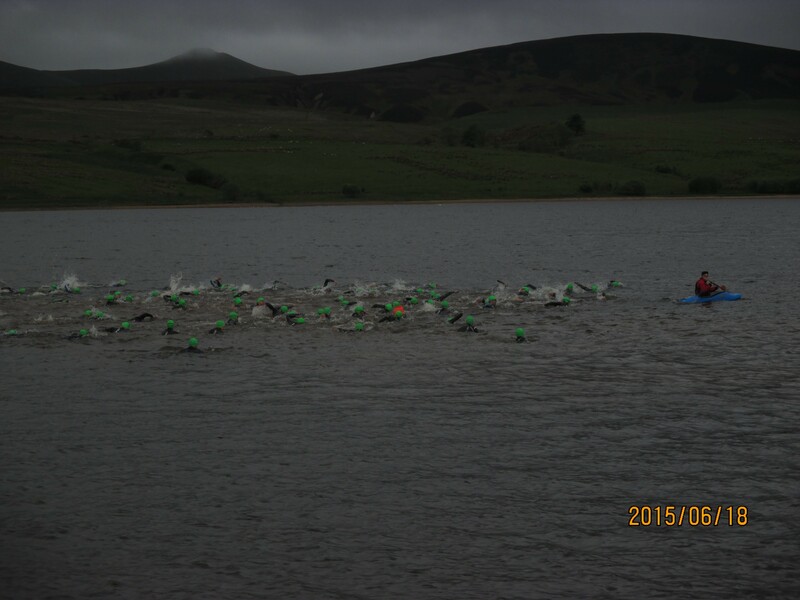 Our club (ERC) had targeted this race for the relay teams, all ably organised and coordinated by Alistair. In the end we had 5 teams of 4; 20 people all creating a sea of red around the briefing area. 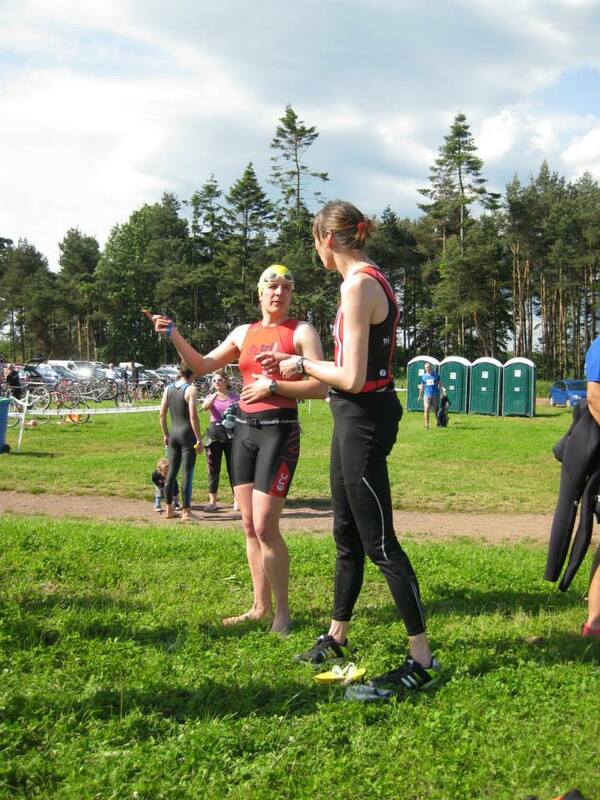 I am not convinced the club trisuit is the most flattering design on me and my women’s specific black number is more comfy, but I wore it anyway to make sure I was identified in the right tribe! Getting everyone together to register was a bit like herding cats, as we all set off at different times to ride round the bike course and see what it was like. We registered with not much time left before the start – and I was going first! Luckily, with a minimal transition and no wetsuit, there wasn’t a lot to get ready. In the water and I was only just checking my goggles were on properly and wasn’t even at the line when Paul shouted “GO!!!”. Yikes! I quickly got going but had missed the front group! Not to worry, I was soon out of the water, avoiding falling in the special hole just before the bank, and was through transition and onto my bike. The course was a lot of fun. A fast part by the lake, then a windy bit of singletrack through some trees, with lush green fronds brushing at your legs. Then a very fast double track section with a few big muddy puddles to catch your wheels! Finally, a zigzag up and down a bank 3 times with some technical little bits to watch out for – a tree stump, some loose ground, gravel and a slidy bit on the final turn back into the field. 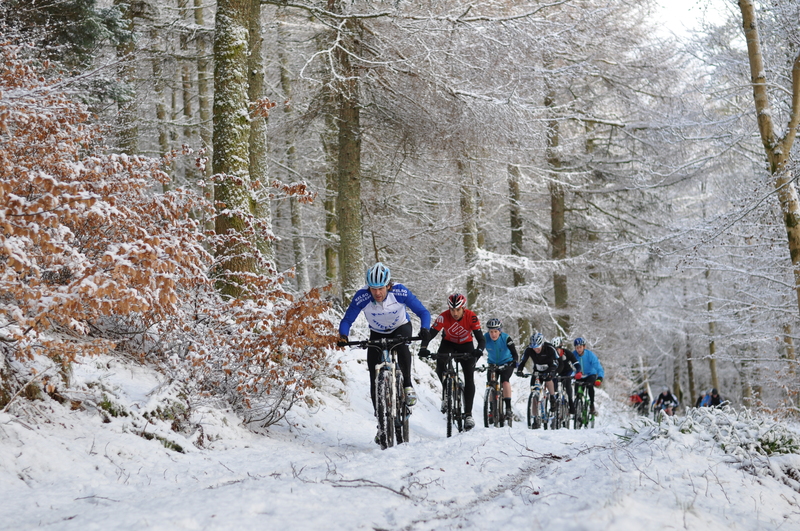 I had overtaken Alistair and Andrew from ERC, and another man I didn’t recognise. One of our guys was claiming ‘he had a mechanical’; to be fair, I did see him off the bike doing something with his chain! I just about remembered to take my helmet off and was soon running. All worries about my legs had been forgotten as I wound through the woods and heard the announcer shouting “you can see the lead person flitting through the trees over there!”. I waved, thinking: are they talking about me?! Before I knew it, I had tagged my next team mate and was under the finishing arch! There followed a whole lot of fun cheering and watching the battle between ‘ERC men A” and “ERC ladies 1”. I passed over to Erin, who came back covered in mud from a fall only witnessed by her boyfriend in the other team (we suspected foul play!). Next up was Elise who battled it out with Mitch the whole way despite some navigational mishaps. 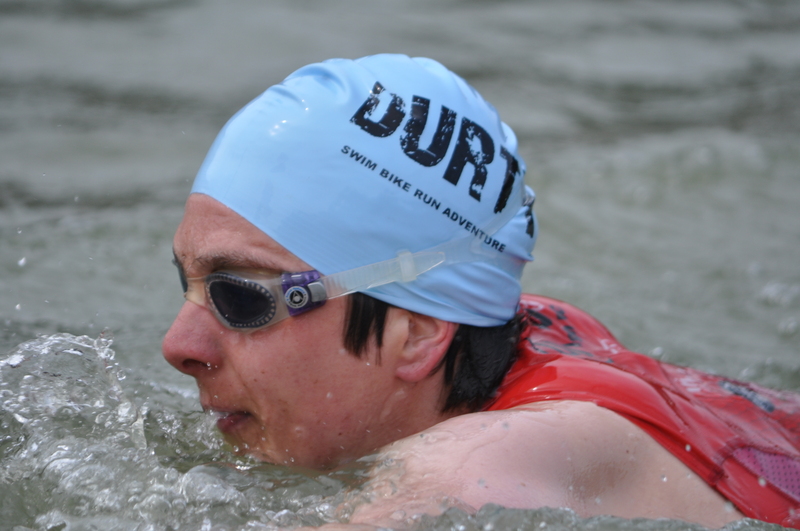 Finally, we handed over to Andrea who got cold shock but was still gaining fast on Chris as she swam a mix of backstroke and breaststroke – and then overtook him as she took the long route round! This format was really good for spectating; you hardly had to wait to see people between disciplines. It was also sunny at this point, which made life easier. We were neck and neck until the 4th leg, when sadly the men pulled away. But still, our girls team was 2nd overall and 1st ladies! Awesome. ERC also got 1, 2, 3 and crowded out the podium … cool. Onto the solo race after a longer than anticipated wait (should have gone and got food instead of just a snack after all). I think Paul (the organiser) was sort of making this up as he went along. Round 1 was 4 random heats and I was in heat 3. We sploshed into the lake from a pontoon this time and I raced round with a chap called Alan. I just beat him to it, winning the heat. Round 2 (3 heats) and everyone was petitioning to only have 3 rounds instead of 4 (the original email said 5 or 6!). I wasn’t too fussed either way, but rain was forecast, it was all taking quite a long time and people were dropping like flies, so it seemed a sensible option. We set off and I was in a heat with Alan again. This time he just beat me to the line. Round 3 was the final one and we were sorted into an ‘A’ and ‘B’ final. I was in ‘A’. Alan had promised he was going to really go for it on the swim this time and I should try and draft him. I hastily got into position at the start, and I did try … but then he was off without me! I wonder if I could have hit it harder, but I’m not sure. Anyway, 4 men including Andrew from our club were in front of me as we started biking. By now it was pouring with rain and the course was a bit slipperier. I was annoyed at myself for dabbing on one corner, but it was no big deal. 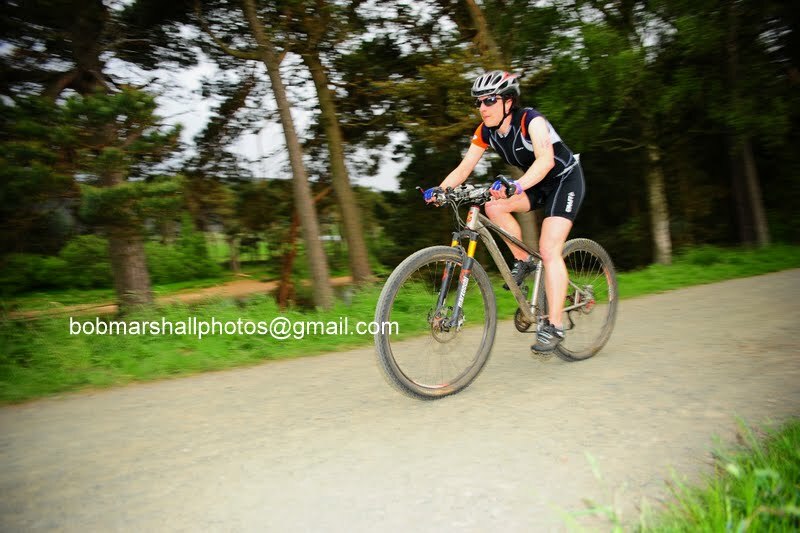 In the end I cruised into the finish a comfortable 4th place, and 1st female. 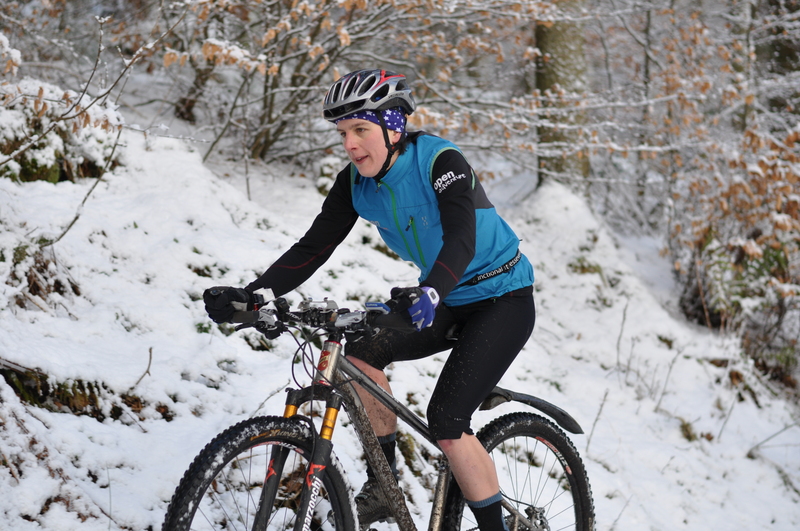 Full results here (relay) and here (solo) and many thanks to Louise Smith and Andy Upton for the photos. 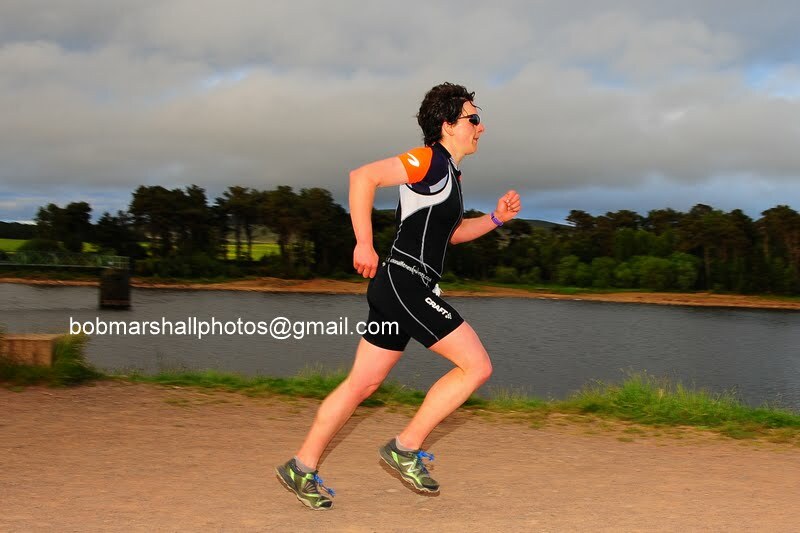 This was a race where my legs rebelled against my requests! When I first considered this race, I was going to make it a ‘B’ race. This means it would only be of moderate importance. However, there was a race I wanted to use to train for Itera on the same weekend as my preferred race, so I changed this to an ‘A’ race. This meant I was targeting it. I generally only have two A races a year (coach’s instructions). Everything had gone to plan in the lead up to the race. I had been doing run training on a consistent basis and managed not to catch any bugs. 10 days before the race I went down on the train to ride the bike course. What a shock to the system! It was definitely tough. It was good to know what was coming up though, and it spurred me into resting well and saving every gram I could to make those climbs easier. Fast forward to race day and I had done a lot of prep. All the extra kit I had for the recce was left in the tent (multi-tool, mudguard, mini lock, phone, coat etc). I had even bought a smaller, lighter seat pack and had a haircut on Friday! In total I think I was ready to start the race carrying nearly 2.5kg less 🙂 . 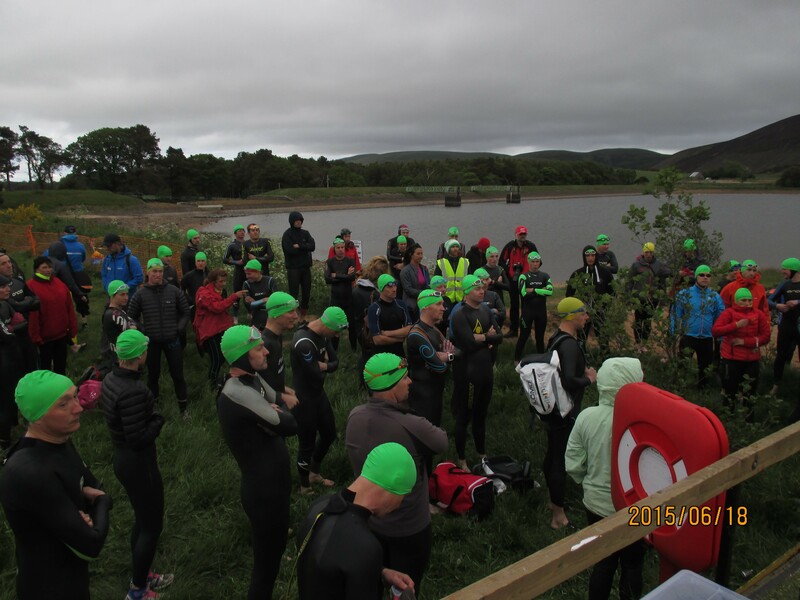 Before the start of the swim – I’m the one waving! This was my favourite and most successful part of the race. The water was pretty warm compared to my last open water swim at Portobello (which is in the North Sea and generally colder than English lakes 😀 ). I was striking out alone after the first 400m or so as the people I was drafting dropped off the pace and I couldn’t catch the lead group by that point. We had to do two big laps. On the return leg of each I had trouble sighting anything as the marker was so far away and I couldn’t see the swimmers in front. I felt I might be veering wildly off course, but by sighting off a small headland, soon enough the buoy came into view. Transition 1 – run across a field and up a hill! I even managed to eat a banana on my way up! Other than that, the transition was unremarkable. There is a lot of climbing on this course. I generally like climbs, but here two of the hills are very steep (up to 30% in places) and are not much to my liking. I wobbled up Wrynose and completely missed Chris Boardman, who was apparently giving everyone a little cheer! Warning! Steep hills await you. My target times were based on a 70km course and I also got held up at a red traffic light for a little while. So my time was actually OK compared to target, but my legs did not feel ‘zippy’ like they do when they are good. This is hard to explain, but when everything comes together and I ask my legs to do something hard, they just respond and I feel great. On this day, right from the first proper hill I could feel that things weren’t like that! I had to fight and had low moments when I even thought ‘what if I just stopped?’ (Of course, I never would!). On the plus side, I rode my own race and didn’t respond when both Sally and Bonnie came past (I expected these two girls to be contending). I also ate well, snacking on the feast of various treats I had prepared on Thursday night. However, by the end of the ride I had slight stomach stitches and my back was very sore. I think this was from riding such steep hills out of the saddle, which I’m just not used to. I had kept stretching out on the bike, but it’s not so easy to do this effectively when you’re on the move! My plan was to finish the bike in my target time feeling like I had something left for the run. Unfortunately, given the ‘disobedient leg’ situation, I started the run feeling pretty tired! I set off anyway, and soon got hot, really hot. Luckily, I recognised the signs from the 2 day in Wales last year, when I got a sort of heat stroke or heat exhaustion from running too hard in hot sun. At the first stream I could easily reach, I stopped and scooped cold water all over my head and neck and face and arms. I also started drinking a lot. As I reached higher ground there was a wind and it was a bit cooler. I was very grateful for this! Apart from my problems with the heat, the uphill was as hard to get up as the ones on the bike. I felt like it was Wrynose all over again! My legs were burning, but I was accompanied by a couple of guys who kept me motivated to carry on pushing. As we reached the ridge, a few people caught up and I stumbled and nearly fell hard, only just saving myself. This happened twice, then I realised that my brain was probably addled due to lack of glycogen. I hadn’t been eating for a while due to the slight cramps coming of the bike. These had now gone away so I munched some more snacks. 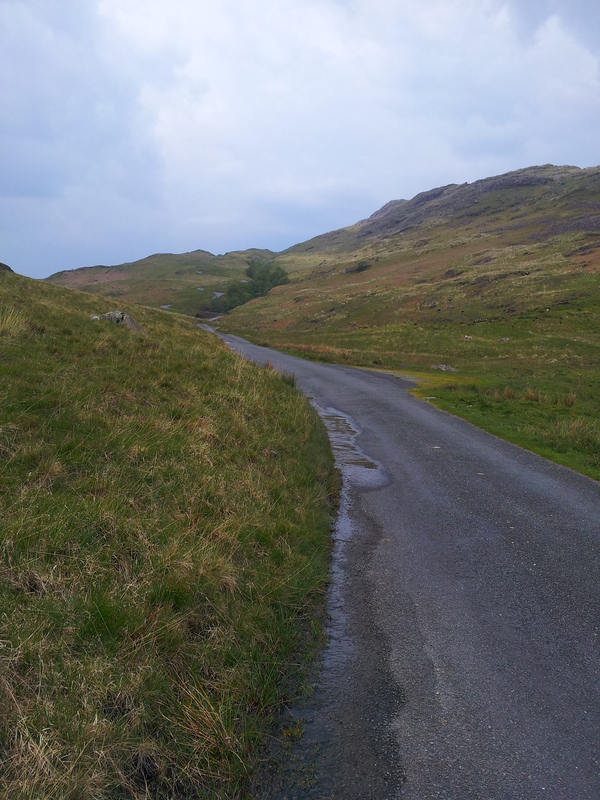 I had been in 3rd place for several hours, but on the descent of Coniston a girl just flew past me. She cheerily asked “is your ankle OK? !” I thought, er no … this is just how I always run down hills! There was nothing I could do to respond. I wanted to stop trying then, but didn’t! I’ve got nothing left in the tank! I felt the run had been a bit of a failure, as I was well off my target time. But the girl was the only person to pass me on the tricky part of the course, and the results later showed that my relative placing for the run stage overall was actually better than for the bike. 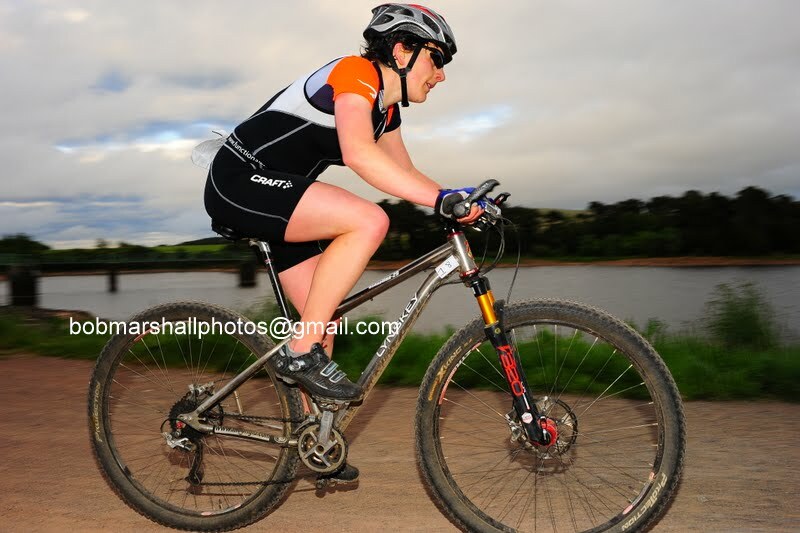 This is very rare for me and suggests I was either having a really bad bike, or a better run than it felt! As I got back to lower ground, I started cooking again, but I had no water left and there were no handy streams so I had to just tough it out. 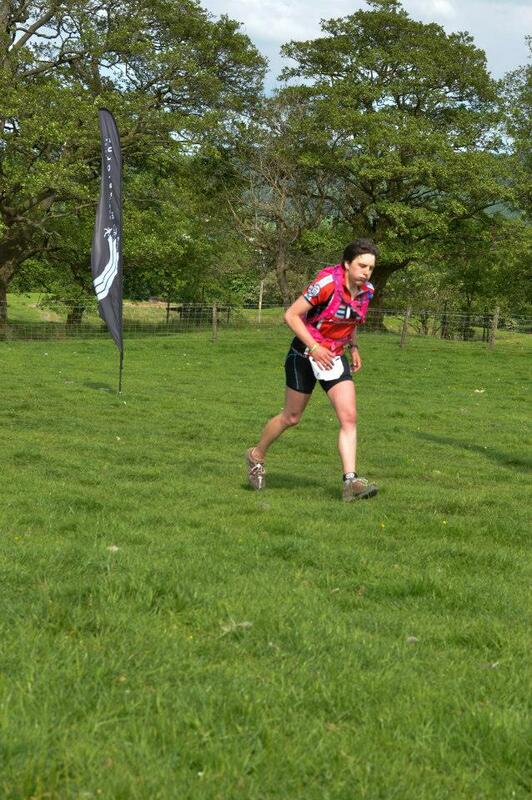 I was determined to run all the way, including the uphill finish which is a sting in the tail! As I crossed the line, my legs crumpled underneath me and I am rarely so relieved to be able to stop. I was left feeling a bit flat after this race, as I put so much in but didn’t really enjoy it and didn’t feel I had performed to my potential. I also can’t pinpoint any clear reason for this. These things seem to matter more when you’ve decided a race is important! However, my coach said “you only fail if you fail to try”. I certainly wasn’t falling short in the effort I put in. Afterwards I had sore legs right up until the next weekend. This is certainly one race that you don’t bounce back from two days later! 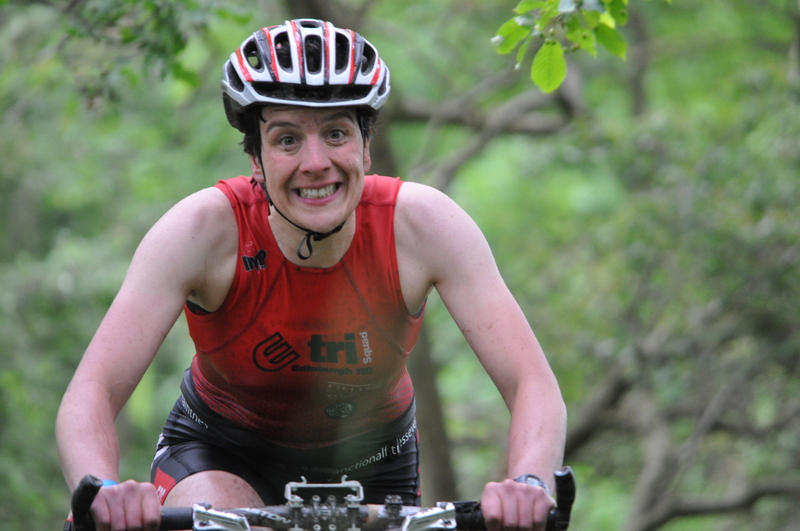 Big well done to top adventure racer Sally Ozanne, who smashed the race to finish first lady and 4th overall. Finally, don’t worry as my next post will be all about a race where I had a lot more fun :D.